Lucille Buchman, age 91, peacefully passed away surrounded by family Monday, March 5, 2018. 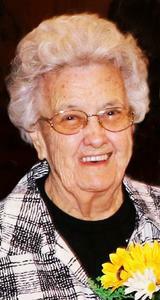 She was born in Racine, March 26, 1926, to the late William and Lena (Schnetter) DuMont. On September 7, 1946, at St. John Nepomuk Catholic Church she was united in marriage to her beloved Charles Buchman who preceded her in death on August 12, 2008 after 62 years of marriage. They were both longtime active members of St. Rita’s Catholic Church where Lucille spent many hours as a member of the Christian Mothers and St. Jude’s Circle. They loved spending weekends in Wautoma and traveling by car whether it was on long trips or just “going for a ride”. They cherished time together as well as time with their children, grandchildren, great grandchildren, family, and friends. She will be dearly missed by her children, Margaret (Leslie) Hoover, Thomas (Carlene) Buchman, Bill (Diana) Buchman, Patti (Richard) Jensen, and Bernie (Chris) Buchman; 12 grandchildren, Jason Buchman, Heather (Collin) Meyer, Melissa Buchman (Cameron), Rachel Buchman, Mary Bergemann, LeAnn (Dave) Danowski, Shelly, Sean (Katie), Mindy, Jim (Vicky) and Jason Hoover, Kim Deschler (Gordy); 17 great grandchildren; nieces and nephews. Lucille was preceded in death by her husband, Chuck; her parents; her sister and brother-in-law, Marie (Stan) Matson; her brother and sister -in- law. Bernard (Mary) DuMont; brother-in-law and sister-in-law, Donald (Jean) Buchman; sister-in-law and brother-in-law, Elaine (Richard) Parent. A private Mass of Christian Burial and celebration of life was held Friday, March 9, 2018 at St. Rita’s Church followed by the family gathering at Holy Cross Cemetery Hwy 32, to lay Mom to rest next to Dad. Our family would like to thank all of the staff at Lakeshore Manor for the personal care and kindness they showed Mom and to Gloria who kept a watchful eye on her.